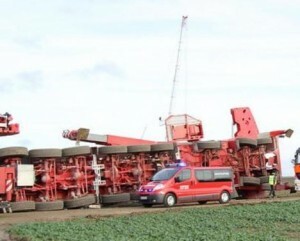 A 750 tonne All Terrain crane overturned yesterday on a wind farm in Germany as it was moving – partially rigged – between turbine installation areas. The crane, a new Liebherr LTM 1750-9.1 owned by Cologne based crane specialist Colonia, had already completed its work on two turbines at the wind farm in Düren-Echtz – between Aachen and Cologne – and was moving along one of the wind farm roads to the third turbine, when it went over. Local police say that a strong gust of wind caught the crane, but this was most likely combined with the uneven ground at the point where it went over. The crane was said to have overturned slowly, which suggests that some of the wheels had left the main part of the road. It was rigged with an extension and jib and had most of its counterweight in place. The operator was rescued from his cab by the emergency services and was taken to hospital suffering from shock. No one else was hurt in the incident, although the crane which was delivered in July will have sustained some serious damage.